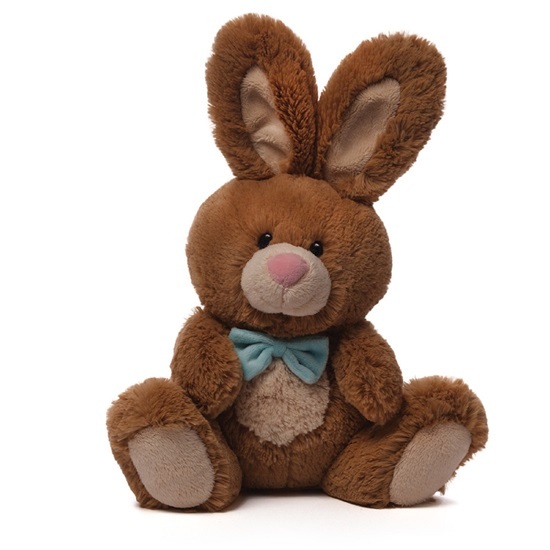 This huggable, soft plush bunny is good for ages 1 and up. Meet "Bops", a soft huggable plush bunny bound to ho his way into your heart. "Bops" is a light brown bunny with a tan tummy, nose, and paw pads. The inside of his ears are also lined with tan. He is wearing a light blue bowtie. "Bops" is surface washable and good for ages 1 and up.